Knowing Bed Bugs Will Help you Kill Them! NORTH BERGEN, New Jersey – The pest management industry’s leading magazine, Pest Control Technology, published an article by Dr. Michael Potter of the University of Kentucky. In the article, he pointed out that people need to “Think like a bed bug” in order to try to prevent and kill bed bugs. This is so very true! Biology Begets Behavior – Essentially knowing the behavior of a bed bug is important. 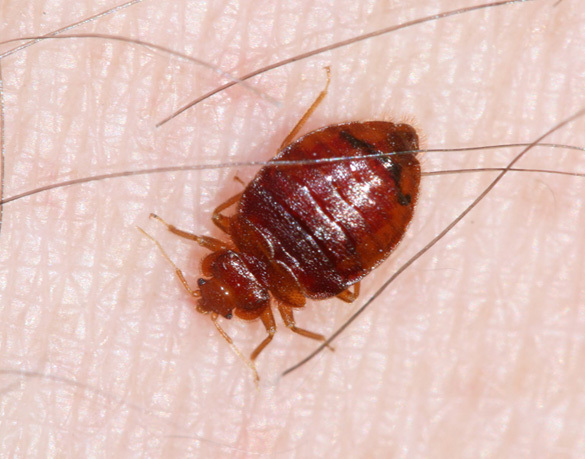 Bed bugs require blood to feed and they cannot survive without it. Thus knowing that bed bugs will seek out a feeding target is important in knowing how to prevent them. Love the One You’re With – Bed bugs love to share small spaces and this is important when looking for a way to prevent them. The folds, seams and other areas in furniture and bedding become regular hiding places for bed bugs. In these areas, using EcoRaider is an ideal tool for killing bed bugs. Conversations We Can’t Hear – Bed bugs communicate through the use of chemical pheromones … this allows them to interact socially and aggregate in one area like a seam of a bed or a cushion of a couch. The pheromones also tell bed bugs that they are in a safe place, either by the chemicals released in the air or those that are left behind in the form of feces or dead skin. Do Not Disturb – Not all bed bugs are seeking a blood source all the time. In between feedings they will communicate with each other trying to alert others to move when there is a threat. Bed bugs move more frequently when they have not fed as opposed to those who have fed. This helps us figure out how bed bugs move and why. EcoRaider® bio-insecticide is the leading natural pest control product used by pest management professionals It is proven by leading universities’ research and government sponsored studies. Several publications show superior performance compared to leading pro-grade pesticides both in the lab and in the field. For the first time, both consumers and professionals can use a green pest product with confidence. EcoRaider has many key benefits, including that it is fast acting, effective with extended protection, and it delivers a quick kill and keeps working for up to two weeks on bed bugs. In addition, it can be used almost anywhere, including on bedding and near food areas. EcoRaider provides a strong natural solution that delivers both an immediate kill and long-term residual against ants. EcoRaider kills ants on contact in one minute, repels ants for up to four weeks, prevents foraging ants from penetrating structures and it also disrupts existing ant trails. EcoRaider is a highly efficacious botanical-based bio-insecticide that can be applied anywhere bed bugs or ants are found without restriction. EcoRaider can be used in various settings, including schools, health-care facilities and public spaces. For more information, call 1-800-338-0212.
https://ecoraiderpmp.com/wp-content/uploads/2017/04/EcoRaider-PMP-BASIC-LOGO-wz-slogn-300x104.png 0 0 Ed DeMask https://ecoraiderpmp.com/wp-content/uploads/2017/04/EcoRaider-PMP-BASIC-LOGO-wz-slogn-300x104.png Ed DeMask2016-07-25 15:08:352018-01-23 16:46:24Knowing Bed Bugs Will Help you Kill Them!